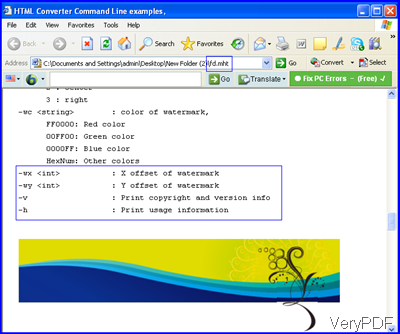 ← How to free convert PDF to Word or RTF online? How to convert long MHT file to multipage PDF? 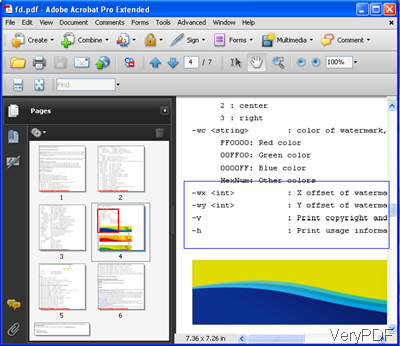 Question:Hello, The PDF that was created from MHT contains the whole MHT in one page. How can I split it correctly for regular paper without split the images? Solution😀 During the conversion, please add the parameter –pageheight and –nosplitimg, then you can convert the long MHT file to multipage PDF file and keep images intact. First, download VeryPDF HTML Converter to your PC. On the website of HTML Converter, there are two versions GUI and command line. In this article, I will do the conversion by the command line version. So after downloading, please unzip it and then open its package to check its elements. Now the command line you’d better use like the following example. The value after parameter “–pageheight” can be set according to your MHT file. It depends on how long would you like to set the page height. After adding parameter “–nosplitimg”, it will not split the image part to adopt the page height you have set in the command line. Now let us compare the conversion effect from the following snapshots. Checking from the above snapshots we can deduce that by adding those two parameter, we can convert long page MHT file to multipage PDF file and keep images in the MHT file intact. If you want to know file format conversion tools, please check on VeryPDF website and if you have any question, please leave us a comment here then we will solve it for you at once. How to convert MHTML & MHT files to high quality PDF files? I want keep text searchable in MHTML & MHT converted PDF files. How to rotate the page when converting EMF to TGA? How to convert a document of html to emf? This entry was posted in HTML Converter (htmltools) and tagged mht to pdf. Bookmark the permalink.